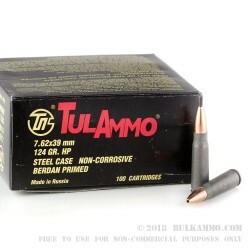 The perfect fuel for your AK range day, Tula 7.62x39 mm steel-cased ammunition is an affordable, high performing option for the high-volume or budget conscious shooter. Equipped with a 124-grain hollow point bullet, these rounds are right at home at the range, in self-defense scenarios, or on a varmint hunt. 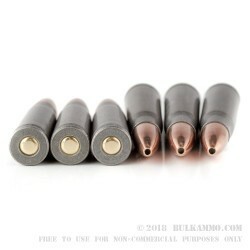 Made with clean burning powders, these Berdan primed, non-reloadable, non-corrosive rounds are poly-coated to provide better feeding and ejection. Originally a producer of brass cased ammunition, Tula switched to steel-cases in the late 1920s to conserve precious metals. Tula has since become a leading steel-case munitions producer, exporting more than 500 million rounds to the US alone. Tula offers a wide variety of calibers and loads, to fit whatever your needs. Their 7.62x39 ammunition is known for its rugged reliability. 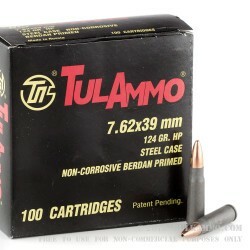 This product contains 100 rounds of 124-grain HP Tula 7.62x39 mm ammunition. I really like this ammo. It did not deliver as neatly as I would like but it does not matter because it will go in ammo box regardless. Q: Is this non corosive ammo? A: Hello Jeff! This Tula ammunition is all new manufacture. As a result, the ammunition does not contain any corrosive components.